Lorenzo Dal Ri – live electronics & sound treatments | Gianni Mimmo – soprano sax, bass sax, piano & prepared piano. Finally on CD this magical collaboration started on winter 2002 and still alive and well! 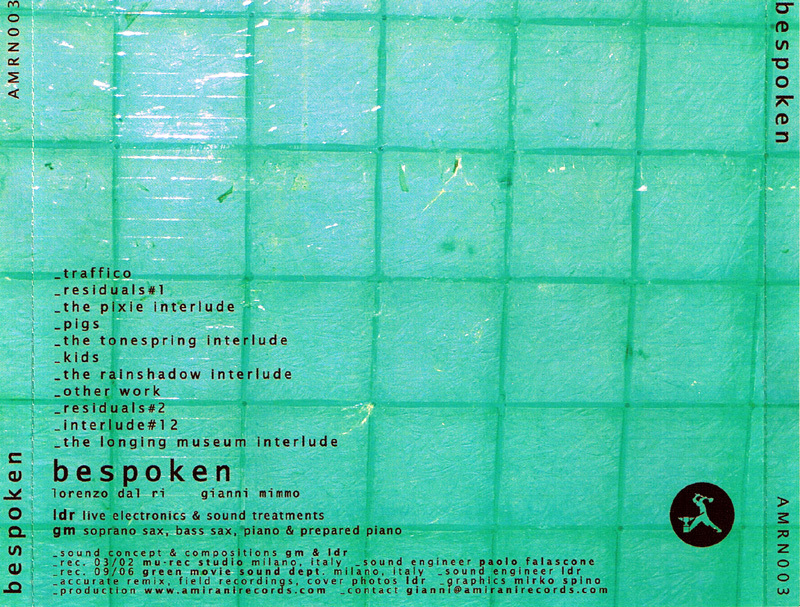 Elegant sound concept and electro-acoustical statement, BESPOKEN is a project performed by Lorenzo Dal Ri (sound treatments, live electronics & field recording) and Gianni Mimmo (soprano & bass saxes, piano & prepared piano). Old and new hits, beautifully mixed by Lorenzo Dal Ri, through inner multi-perspective sound tales. A new, fresh, unheard way to investigate the relationship between acoustical attitude and pure sound coming from daily soundscapes and life calls. Bespoken shares the opportunity to listen sincerely Old hits like Traffico and new cuts like “The pixie interlude”, and the round-about “Kids” will be your deep feeling soundtracks. Nice cover with stunning photos by LDR! Essential Refined True. Don’t miss this one! !